Under the surface, Chromebook Pixel is just another Core i5 laptop, albeit with a rather special screen. But it's what it represents that's most stunning. Previous Chromebooks have been rather tepid affairs, lacking both power and failing to acknowledge that although we increasingly use cloud apps and services, we just don't "live in the cloud" as yet. But Pixel sees Google getting serious; this is a powerful machine, make no mistake, complete with Gorilla Glass touchscreen, 4GB of RAM and premium touches such as a backlit keyboard. What's more, Google wants to go right to the heart of two companies it has so far bettered in the mobile space but hasn't matched on other hardware – Microsoft and Apple's core PC business. I use 'PC' because that's what we're talking about here. Despite the addition of an LTE version in the U.S., the Chromebook is still a very traditional product in the sense that it's a laptop, like a MacBook or a Windows Ultrabook. Tablets are Android's domain. While Apple claims to be post-PC yet still makes them, Microsoft could be the real loser here. The opportunity is there for Google to steal a march on Microsoft as it struggles to contain the threat to Windows from mobile operating systems and the increasing disinterest from corporations as they look for cheaper substitutes for Windows and Office. Chromebook offers this alternative. This device also turns a corner, as we get a little amount of flash storage (32GB or 64GB). What's more, Google is now starting to show that it knows Chrome OS has faults – it recently bought the excellent QuickOffice to sit in Chrome OS and provide a workflow that not only plays nice with the company's apps on iOS and Android, but also offers a genuine alternative to full-blown Microsoft Office. More corporations are also looking at Google Apps as a way to move away from Microsoft for email systems, too. Again, for companies that have opted for that, Chromebooks now looks like they could be a decent alternative to the corporate laptop. But Pixel itself is too expensive for general business use. 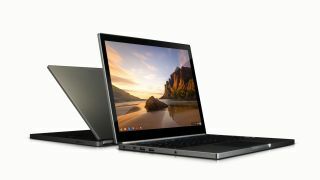 The laptop is, shall we say, a premium product and it will be hard for Google to justify the GB£1,049/US$1,299 asking price. It might be substantially cheaper than a Retina MacBook Pro, but it's more expensive than a MacBook Air or many Ultrabooks. Can you really see yourself buying this instead of a MacBook Air or Windows Ultrabook despite the better screen? Answer honestly now. But the point stands; this is a new beginning for Chromebook – and for Chrome OS. As if it wasn't already, Microsoft is getting squeezed.